My grandfather Frank Severin Erickson shown here in this photograph and along with my uncle Ernest Julius Erickson served as Oregon Railroad Deputies out of La Grande, Oregon in 1917 and 1918. Frank and Ernest Julius lived in rooming houses while they were traveling out west. This period of their travels out west was just before the outbreak of the US involvement in World War I. Both would volunteer and be members of the American Expeditionary Force (AEF). Frank would serve with the 308th Infantry and fortunately become a surviving member of the well documented Lost Battalion. The name, the Lost Battalion was originally given to the 77th Division by a newspaperman, in an article he was writing describing the extraordinarily treacherous situation that began on October 2nd, 1918 in the Argonne. As Frank often said afterwards, "We were never lost, we were just encircled and trapped behind enemy lines." The 77th consisted of nine companies of the United States 77th Division of the American Expeditionary Force, consisted of 554 men that were surrounded by German forces in the Argonne Forest in France between October 2nd through the 8th of 1918. Roughly 197 were killed in battle and approximately 150 went missing in action and or were taken prisoner. Only 194 remaining men walked out alive. Ernest would serve with the 361st Infantry and found himself along with his regiment in the midst of the Battle of the Argonne Forest, in what would be referred to as The Meuse - Argonne Offensive located on the Western Front in France. It was fought from September 26th 1918, until the Armistice on the 11th of November, 1918, a total of 47 days. The Meuse-Argonne Offensive was the largest in United States military history, involving 1.2 million American soldiers, and was one of a series of Allied attacks known as the Hundred Days Offensive, which brought an end to the war. The battle cost 28,000 German lives and 26,277 American lives, making it the largest and bloodiest operation of World War I for the American Expeditionary Force (AEF), which was commanded by General John J. Pershing. Ernest Julius wrote regularly in his diary, in calm situations and by the end of his life, in the most dangerous of situations, yet still having an unique sense of humor in those dire circumstances. I can only imagine what it was like to be stuck down in a cold muddy exposed trench, writing his personal thoughts. Up above ground as battles raged, sniper fire sounding and German artillery soaring overhead must have been mind altering. Ofttimes exploding shells landing far too close for comfort. He began his final writings in his diary one morning on the 26th of September of 1918. 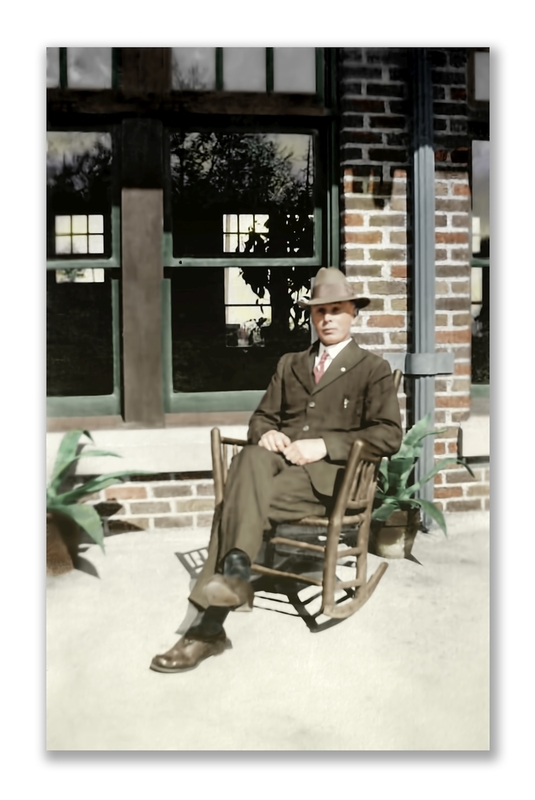 Ernest Julius 'Oregon Diary' is a fascinating story, written before joining the AEF in 1917. The writings cover the brother's adventures on the west coast. The photograph of Frank taken outside a tavern in Tacoma, Washington comes to mind every time I watch John Ford's 1946 western, 'My Darling Clementine.' 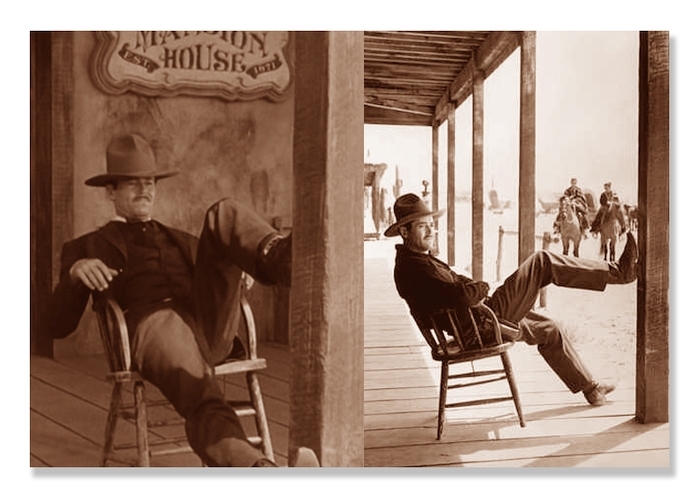 Henry Fonda as Wyatt Earp pantomimes a two-step dance while sitting in a chair outside the saloon in Tombstone, Arizona. When you compare the photographs below, one can come to the easy assumption how the western myth blossomed in Frank's life not all that long after he arrived in the states from Sweden. When the movie came along almost 30 years later, the tale of Earp Brothers and the shoot-out at the OK Coral was myth turned up bright on the silver screen. Frank read in the popular pulp magazines at the turn of the century colorful western stories that filled his head with ideas. He chose to go out west in 1910 to find his western dreams. The tales from his readings left indelible marks and the photographs Frank sent home to his family echoed in my father's imagination what was possible and what true adventure was all about. The images pushed into my perceptions and in the end, with time and memory always at work, we can see how the continuation of things can exist inside a family. Whether riding a horse, flying a bomber over Germany, sliding down the cold surf of the Pacific or spreading paint across a vast canvas, the imagination runs rampant. The stories only ink them more indelibly in our paths.